DOIs have been minted for ILAS/ILAS-II datasets. The datasets are released from Database - Atmospheric and Oceanic Monitoring. A new website "Asia-Pacific Monitoring Sites" is open. A dataset "Atmospheric CO2 mole fraction data by aircraft (CONTRAIL-CME) " is released from Database - Atmospheric and Oceanic Monitoring. 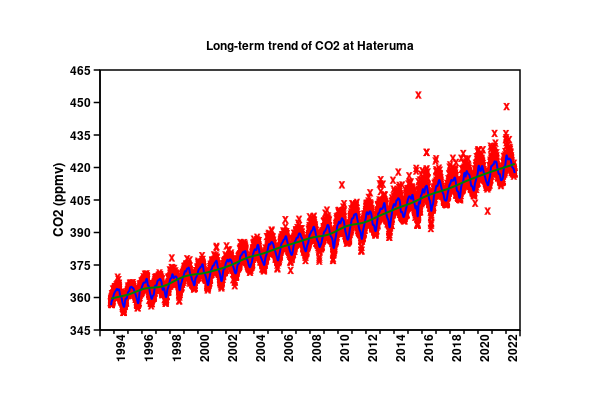 A dataset "Daily observational data of atmospheric CO2 mixing ratios at the summit of Mt. Fuji" is released from Database - Atmospheric and Oceanic Monitoring. DOI has been minted for the following dataset on the website "ODIAC Fossil Fuel Emission Dataset". 5 monitoring stations are added, i.e., Sapporo (Hokkaido), Yokohama (Kanagawa), Nagoya (Aichi), Ootsu (Shiga), and Miyazaki (Miyazaki). DOIs have been minted for the following datasets in the Database - Atmospheric and Oceanic Monitoring. DOIs* have been minted for the following datasets in Database - Atmospheric and Oceanic Monitoring. A digital object identifier DOI is used to permanently identify an object such as an electronic document. The DOI provides more stable linking than a URL, because if the document&apos;s URL changes, the DOI metadata are updated to link to the new URL. NIES is able to mint DOIs via JaLC of which we became a member since 2016. The GED user registration system has been updated with new functions. The website "Monitoring of Global Warming Effects (Alpine Zone-Central Japan, Hokkaido)" has been renewed. 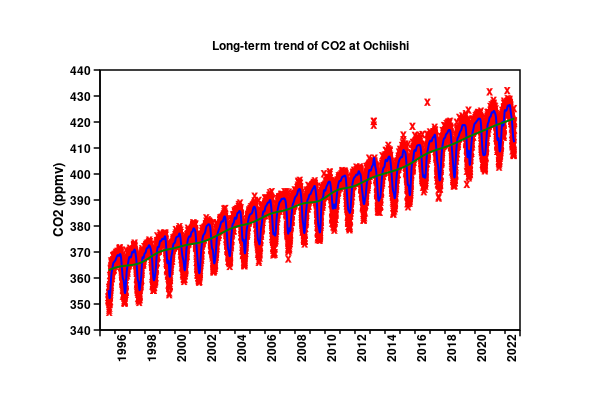 A new website "ODIAC Fossil Fuel Emission Dataset" is open. A new website "Information on Vitamin D Synthesis / Erythemal UV" is open. It provides real time data at five Japanese sites. A new database &apos;GED&apos; (Global Environmental Database) is released. The portal site of databases, GED and &apos;GGTU&apos; (Greenhouse Gases Trend Update) has been integrated for user&apos;s convinience. The potal site of global environmental databases is repaired. New features such as data search has been added. In order to facilitate the scientific understanding, future projection and impact assessment of global environmental change, international and multidisciplinary information is of utmost importance. Environmental problems such as climate change are now recognized as being caused by human activities, and mitigation countermeasures are being discussed. It is, therefore, essential that research results on environmental problems are disseminated not only to researchers, but also to the public in an easily understandable way. The Center for Global Environmental Research (CGER) at the National Institute for Environmental Studies (NIES) has established a Global Environmental Database (GED), which comprises data and research results collected and compiled from natural and social sciences. The GED serves as a fundamental database related to global environmental problems with an emphasis on global warming and climate change. You can choose from the following menu: &apos;Database&apos;, &apos;Real Time Data&apos;, &apos;Analysis Support&apos;, &apos;Associated Data&apos; and &apos;Data Search&apos;. In &apos;Database&apos;, quality controlled open data of global environmental monitoring projects is provided in original format or NASA Ames format. In addition, the graphic function allows a view of the data at a glance. In &apos;Real Time Data&apos;, continuously updated data at almost real time is provided. Since this contains the most up-to-date data, this is very helpful to quickly grasp the present situation. Please note that some data have not gone through full quality control. For a more detailed analysis, it is recommended to use quality controlled data in &apos;Database&apos;. &apos;Analysis Support&apos; provides data and online applications that are helpful to make your own analyses using GED data. &apos;Associated Data&apos; lists the data and results of CGER research projects in a wide range of fields grouped into different research themes. Research conducted in collaboration with other centers at NIES (Center for Social and Environmental Systems Research, Center for Environmental Biology and Ecosystem Studies, Center for Environmental Measurement and Analysis) are also included. Here, not only data but also various reports (e.g. CGER Report Series) are provided. In &apos;Data Search&apos;, data can be looked up in multi-discipline and multi-project combinations from the wide range of data provided at this site. If you already have a specific target, search can be made also for metadata or from the observation map. We at the Global Environmental Database continue to strive to integrate multiple databases in various fields into one united database system, and thus, to facilitate data search and retrieval for the users. If you have queries relating to the database or the data provided at this site, please contact us at the address below. User registration is required to download the numerical data.